The Cuomo Administration is out with results of the latest round of state-run inspections of track and oil tanker train cars across the state. Governor Andrew M. Cuomo today announced completion of another round of targeted crude oil tank car and rail inspections. These inspections uncovered 85 defects – including four critical safety defects that required immediate corrective action. The inspections are part of the Governor’s push to protect New Yorkers from the potential dangers associated with the transport of crude oil by freight rail companies. State and federal teams examined 487 crude oil tank cars and approximately 213 miles of track in these inspections. Last week, inspection teams from the New York State Department of Transportation and the Federal Railroad Administration carried out crude oil tanker inspections at the CSX Corporation-owned Selkirk Yard in the below counties. The inspections focused on track, track hardware and tank car mechanical safety equipment, including wheels and brakes. The teams also performed hazardous materials inspections to ensure that equipment is in line with regulations, including valves, valve closures, and placards that describe the cargo being shipped. They also checked tank car inspection and pressure test dates. Additionally, they inspected the Canadian Pacific mainline track between Whitehall, Washington County, and Burnt Hills, Albany County, and Clarendon & Pittsford Railroad Co track at the Whitehall yard, Washington County. Critical defects identify important maintenance issues that must be addressed immediately, but do not necessarily indicate safety lapses. Non-critical rail defects must be repaired within 30 days, while all tank car defects must be fixed before the train departs the yard. If that is not possible, the affected car will be pulled from the train to await repair. CSX Mainline Track Inspection – Alden to Blasdell, City of Buffalo – The Department of Transportation track inspectors examined approximately 28 miles of track and 39 switches along the CSX mainline from Alden to Blasdell in the city of Buffalo. The inspectors found 13 non-critical defects, including loose or missing bolts, a loose rail brace and insufficient joint bolts. CSX Mainline Track Inspection – NY/PA line in Chautauqua County to City of Hamburg, Erie County – Federal Railroad Administration track inspectors examined approximately 60 miles of track and three switches along the CSX mainline from the NY/PA state line in Chautauqua County to the city of Hamburg in Erie County. The inspectors found one non-critical defect, a drainage ditch that was obstructed with debris. CSX Mainline Track Inspection – Syracuse, Onondaga County and Rome, Oneida County – Federal Railroad Administration track inspectors examined approximately three miles of track and 14 switches along the CSX mainline in Syracuse, Onondaga County and Rome, Oneida County. The inspectors found three critical defects, including chipped tread on a switch transition device, a less than allowable guard check gage and a gage dimension that exceeded allowable limits, all of which were repaired immediately. The inspectors also found 35 non-critical defects, including loose, worn or missing switch rod bolts, guard rail clamps and clip bolts, worn or missing cotter pins, loose guard rail bolts, broken guard rail plates, loose or missing rail braces and switch transition bolts, fouled ballast and insufficient fasteners. CSX Mainline Track Inspection – Fonda, Montgomery County to Rome, Oneida County –The Department of Transportation track inspectors examined approximately 63 miles of track and eight switches along the CSX mainline between Fonda, Montgomery County, and Rome, Oneida County. The inspectors found one critical defect, a chipped switch transition device that was immediately repaired. The inspectors also found eight non-critical defects, including fouled ballast, insecure switch heel, and loose, worn or missing guardrail components and guardrail bolts. Canadian Pacific Mainline Track Inspection – Whitehall, Washington County to Burnt Hills, Albany County – The Department of Transportation track inspectors examined approximately 57 miles of track and six switches along the Canadian Pacific mainline between Whitehall, Washington County, and Burnt Hills, Albany County. The inspectors found nine non-critical defects, including insufficient fasteners, loose or missing switch transition device bolts, an obstruction between the base of the rail and tie plate, missing switch heel bolt, improper culvert drainage, and missing joint bolts. Whitehall Yard, Washington County – Federal Railroad Administration track inspectors examined two miles of track and 12 switches at the Clarendon & Pittsford Railroad Co. Whitehall Yard in Washington County and found 12 non-critical safety defects, including insecure switch heels, loose or missing bolts, improper fit between the switch point and rails, and a three-inch separation between the head and web of the rail. Albany – At the Kenwood Rail Yard in Albany, rail equipment inspectors examined 119 crude oil tank cars at Global Energy’s facility and found nine non-critical defects, including thin brake shoes and a bent sill step. Inspectors also examined 89 crude oil tank cars at Buckeye Partner’s facility and found no defects. Hazardous material inspectors examined 40 crude oil tank cars at Global Energy’s facility and found no defects. Selkirk – At the Selkirk Rail Yard, hazardous material inspectors examined 198 crude oil tank cars and found no defects. Buffalo – At the Frontier Rail Yard in Buffalo, there were no oil trains in the rail yard to be inspected. At Buffalo Southern Railroad’s Hamburg Yard in Buffalo, rail equipment inspectors examined 18 crude oil tank cars and found three non-critical defects, including end-of-car air hoses inadequate distances from rails and loose side safety rails. 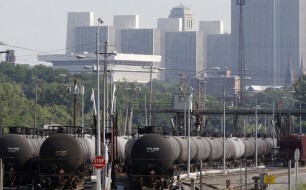 At Buffalo & Pittsburgh’s D Yard in Buffalo, rail equipment inspectors examined 23 crude oil tank cars and found no defects. Crescent and Mechanicville – At Canadian Pacific sidings in Saratoga County operating practice inspectors checked for proper train securement. In Crescent, an empty northbound crude oil train was found to be properly secured. In Mechanicville, a loaded southbound ethanol train was found to be secure. Since this targeted inspection campaign began in February 2014, Department of Transportation and its federal partners have inspected 9,846 rail cars (including 7,838 crude oil tank cars) and 3,234 miles of track, uncovered 1,217 defects, and issued 20 hazardous materials violations. Increased inspections of railroad tracks and tank cars are one of the aggressive actions New York State has taken following a series of out-of-state disasters involving the transport of crude oil from the Bakken oil fields centered in North Dakota. Last year, at the direction of Governor Cuomo, state agencies conducted a coordinated review of safety procedures and emergency response preparedness related to increased shipments of Bakken crude across nearly 1,000 miles of New York State. The agencies issued a report in April 2014 containing 27 recommendations for state government, federal government and industry to take to reduce risks and increase public safety in the transport of crude oil. To date, state agencies have started to implement all 12 state government recommendations and have completed five. Specifically, New York State has taken 66 actions to better prepare state and local responders in the event of a crude oil incident as detailed in a progress report released in December. The state will continue to work to fully implement all 12 recommendations. In addition, Governor Cuomo’s 2015 Opportunity Agenda and the 2015-16 State Budget includes several measures to further prevent and prepare for potential crude oil incidents. These include providing the necessary funding for staff and associated preparedness costs by increasing the Oil Spill Fund cap to $40 million from $25 million and allowing up to $2.1 million of the Fund annually to be used for prevention and preparedness measures. These changes support compliance with Governor Cuomo’s Executive Order 125, which outlines steps the state is taking to improve oil spill response and prevention. In addition, the state budget provides for eight new employees at the Department of Environmental Conservation and six at the Office of Fire Protection and Control dedicated to oil spill planning, training and response. The budget also increases fees for oil transported through New York to 13.75 cents per barrel from 12.25 cents for oil imported into the state, and 1.5 cents for transshipped oil, irrespective of whether the oil remains in New York or is transferred on to another State. In-state end users will be exempted from the fee increase and will remain at 12.25 cents per barrel. · Calling on federal authorities to expedite and strengthen rail safety standards and increase inspections.